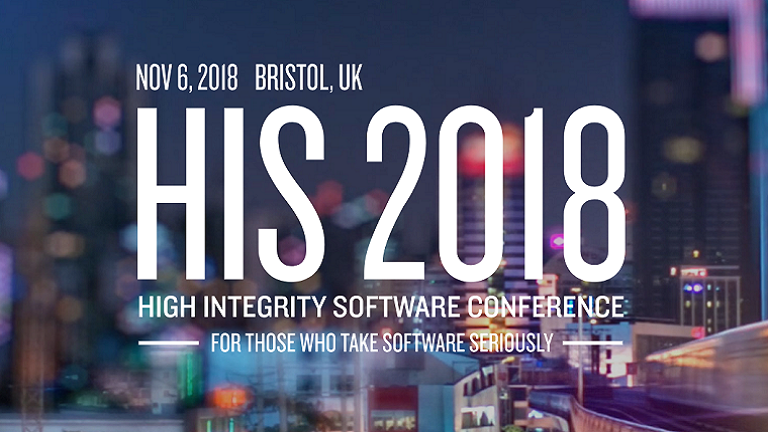 The High Integrity Software Conference will take place in Bristol on 6th November 2018. 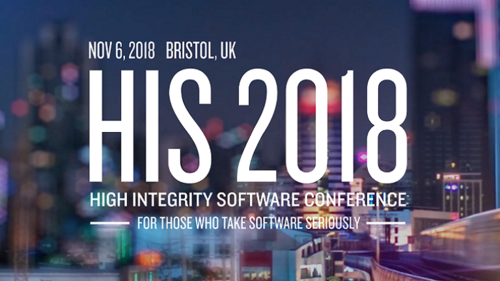 Now entering its fifth year, the conference continues to be the premier annual forum for the sharing of challenges, best practice and experience between software engineering practitioners – for software that matters. This mission continues to grow in importance, with 2018 having once again been a year in which software fallibility, cyber security breaches and the loss of public trust in autonomous systems have made headlines. The conference continues to benefit from the long-standing support of key industry players AdaCore, Altran and Jaguar Land Rover, whose contribution ensures that the programme captures the most pressing and relevant issues and topics of debate. This year, four themes will frame the conference content: Assured Autonomous Systems, Hardware/Software Architectures, Cyber Security - People & Practice, and Languages & Applications. Two keynote speakers have been confirmed to represent the industrial and academic view: Simon Burton, Chief Expert Safety Reliability and Availability at Bosch, and Andrew Blyth, Head of Information Security Research Group at the University of South Wales. Those interested in attending the conference can view further details and register via the conference website. Altran ranks as the undisputed global leader in Engineering and R&D services (ER&D), following its acquisition of Aricent. The company offers clients an unmatched value proposition to address their transformation and innovation needs. Altran works alongside its clients, from initial concept through industrialisation, to invent the products and services of tomorrow. For over 30 years, the company has provided expertise in aerospace, automotive, defence, energy, finance, life sciences, railway and telecommunications. The Aricent acquisition extends this leadership to semiconductors, digital experience and design innovation. Combined, Altran and Aricent generated revenues of €2.9 billion in 2017, with some 45,000 employees in more than 30 countries. • The GNAT Pro development environment for Ada, a complete toolset for designing, implementing, and managing applications that demand high reliability and maintainability. • The CodePeer advanced static analysis tool, an automatic Ada code reviewer and validator that can detect and eliminate errors both during development and retrospectively on existing software. • The SPARK Pro verification environment, a toolset based on formal methods and oriented towards high-assurance systems. • The QGen model-based development tool, a qualifiable and customisable code generator and verifier for Simulink® and Stateflow® models, intended for safety-critical control systems. This press release was distributed by ResponseSource Press Release Wire on behalf of Altran in the following categories: Manufacturing, Engineering & Energy, Computing & Telecoms, for more information visit https://pressreleasewire.responsesource.com/about.